Welcome to CRIU, a project to implement checkpoint/restore functionality for Linux. 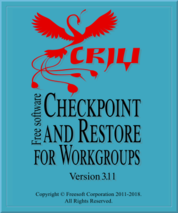 Checkpoint/Restore In Userspace, or CRIU (pronounced kree-oo, IPA: /krɪʊ/, Russian: криу), is a software tool for the Linux operating system. Using this tool, you can freeze a running application (or part of it) and checkpoint it as a collection of files on disk. You can then use the files to restore the application and run it exactly as it was during the time of the freeze. With this feature, application live migration, snapshots, remote debugging, and many other things are possible. CRIU started as a project of Virtuozzo, and grew with tremendous help from the community. It is currently used by (integrated into) OpenVZ, LXC/LXD, Docker, Podman, and other software, and packaged for many Linux distributions. Three ways to start using the C/R functionality. More info about APIs. Collection of real world examples of how to use CRIU. Some are complex, some are not. HOW TO dump a simple loop might be the best one to start with. Also a set of asciinema records for real-life examples. CRIU cannot (yet) save and restore every single bit of tasks' state. This page describes what bits visible through standard kernel API are such. What an application could do to make CRIU refuse to dump it. This page was last edited on 13 March 2019, at 17:49.